Pervez Musharraf: "People at the lower level don't like the visibility of foreign troops." CNN's Suzanne Malveaux reports on Bush's meeting with Musharraf. Pakistan's president discusses the Iraq war and terrorism with CNN's Wolf Blitzer. WASHINGTON (CNN) -- The U.S.-led invasion of Iraq was a mistake that has made the world a more dangerous place, but a swift withdrawal would make matters worse, Pakistan's president said this weekend. "I think it's less safe," Gen. Pervez Musharraf said on CNN's "Late Edition with Wolf Blitzer." Asked whether he considered the invasion a mistake, the Pakistani leader said: "With hindsight, yes. We have landed ourselves in more trouble, yes." Musharraf was in Washington on Saturday for a brief meeting with U.S. President George W. Bush and is now in London for talks with British Prime Minister Tony Blair on Monday. Although ousted Iraqi President Saddam Hussein "was a hated man" in his own country, many Iraqis have now turned their wrath on the U.S.-led forces that remain behind to provide security for an interim government, Musharraf said. "People at the lower level don't like the visibility of foreign troops who are in their country," he said. Pakistan opposed the U.S.-led invasion of Iraq. However, Musharraf said he does not believe U.S. and coalition troops should pull out immediately. Only after elections are held and the situation stabilized should the United States consider a withdrawal from Iraq, he said. "[An early withdrawal] would create more problems in the region," he said. "Now that we are there, we need to stabilize the situation." After the interview, a Pakistani government spokesman called CNN to say that Musharraf did not intend to be categorical in his assertion that Bush had erred in invading Iraq. Musharraf urged the United States to work toward resolving the Israeli-Palestinian conflict, which he described as "the heart of all the problems" in the Middle East. An Israeli-Palestinian agreement would "pull the rug from under the feet of all the extremist organizations." Regarding the hunt for bin Laden, Musharraf said the recent withdrawal of some 7,000 Pakistani troops from South Waziristan, along the border with Afghanistan, did not mean that his commitment to find the al Qaeda leader was flagging. "They are getting relocated in a manner that we keep this whole area under our control and then we use all our intelligence means, all our resources, to locate every terrorist, and let's fight them," Musharraf said. 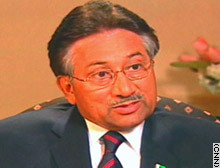 "When you talk only of bin Laden, frankly, the issue is not going and locating one individual," Musharraf said. "We are operating against all terrorists. Now, within that, we don't know where he is. He may be anywhere." In previous interviews, Musharraf had suggested bin Laden had kidney problems and needed dialysis. Asked if he still believes that, Musharraf said he now knows only that bin Laden is alive. "All the intelligence said that he had -- he suffers from -- kidney problems, that he got dialysis machines into the area. But since then, he is alive, that I am sure of. I don't really know how much he is suffering," he said. Musharraf added that he thinks bin Laden's control of his terrorist network is diminished, because the communication network needed to maintain control would likely be under surveillance and thus not used, and because the al Qaeda command structure "is broken, as far as the Pakistan side is concerned." Although relations between the United States and Pakistan have improved significantly since the terrorist attacks of September 11, 2001, a dispute over the pardoning of a Pakistani nuclear scientist who attempted to sell nuclear weapons to Iran, Libya and North Korea has hurt relations. Musharraf pardoned the scientist, A.Q. Khan, and has allowed neither the U.S. government nor International Atomic Energy Agency officials to talk with him. The requests show "a lack of trust in us and it shows a lack of trust in our capabilities," Musharraf said. "If anyone thinks that he can question A.Q. Khan better than us, well I don't agree with that at all."